Drawing on a Flat or Tilted Surface - Which Angle is Best? 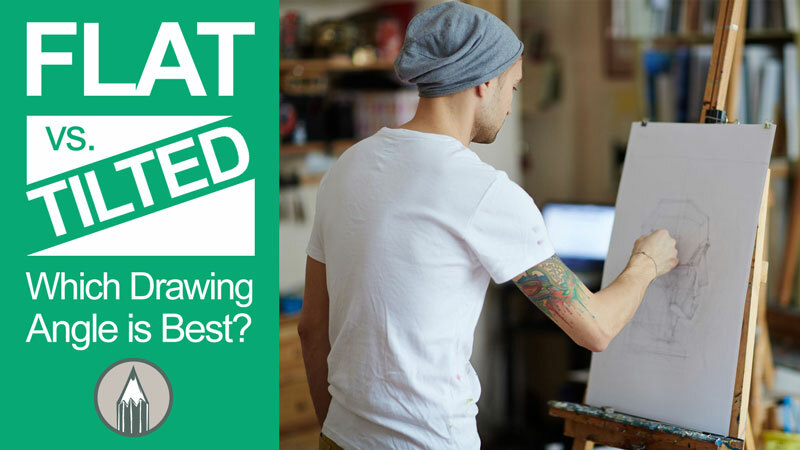 Drawing on a Flat Or Tilted Surface – Which is Best? Some of us draw on flat surfaces, like a table, while others prefer to draw on a tilted surface, like an easel or a drafting table. But which is better? Which setup leads to more accuracy in our drawings? 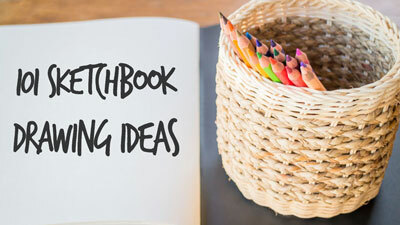 In this post, we’ll look at the pros and cons of each arrangement and I’ll let you decide which is best for you. It’s important to be comfortable when you are drawing. When your body is comfortable, you’re less likely to be distracted by your posture and you can devote more energy to the actual “act” of drawing. You’re more likely to focus on the lines, shapes, and values instead of that little pain in your lower back. No matter which arrangement works best for you, you should always consider your comfort. Since most of us start our artistic life drawing on a flat surface, it only makes sense that many of us are comfortable with drawing from this angle. We learn to write this way, so drawing in this manner seems like a logical approach. This arrangement is also more accessible since most of us don’t have to look too hard to find a table. Everyone doesn’t have access to an easel or a drafting table after all. Many folks are able to create amazing drawings working on a flat surface, but I’ve found that drawing on a flat surface can actual hinder your success. To understand how this can happen, we have to understand how we are seeing the drawing and how the angle can affect the marks that we make. We know how important “seeing” is to drawing. 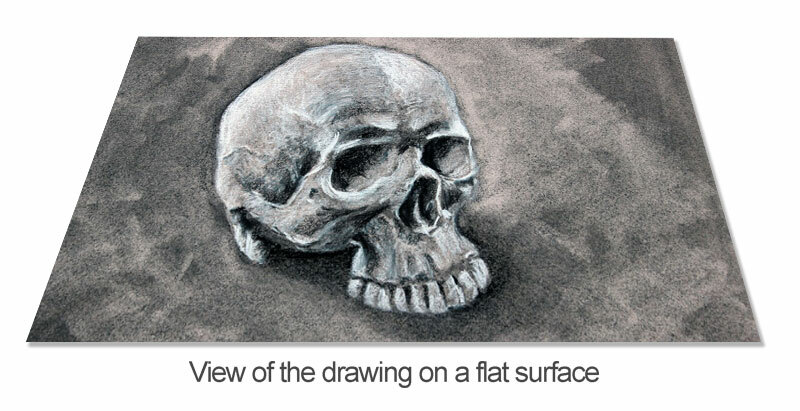 Drawing is largely about how we see and understand objects. The marks that are made are important as well, but knowing how to see as an artist is paramount. When we observe the subjects and objects that we draw, we typically view them from a 90 degree angle. In others words, we position our head to view them directly. This is especially true when we are drawing subjects from life, instead of from a photo reference. We then go to the drawing surface, remembering what we have seen, and make marks to reflect our observations. This, in essence, is the process of drawing. The problem arises when we start making marks on the drawing surface. Because we are working on a flat surface, the angle in which we view the paper is different from the angle that we viewed the subject. This change in view point changes all of the angles that we perceive as we make marks, if only slightly. But slight variations in angles can lead to major distortion. It helps to be aware of this, but small variations are almost unavoidable. 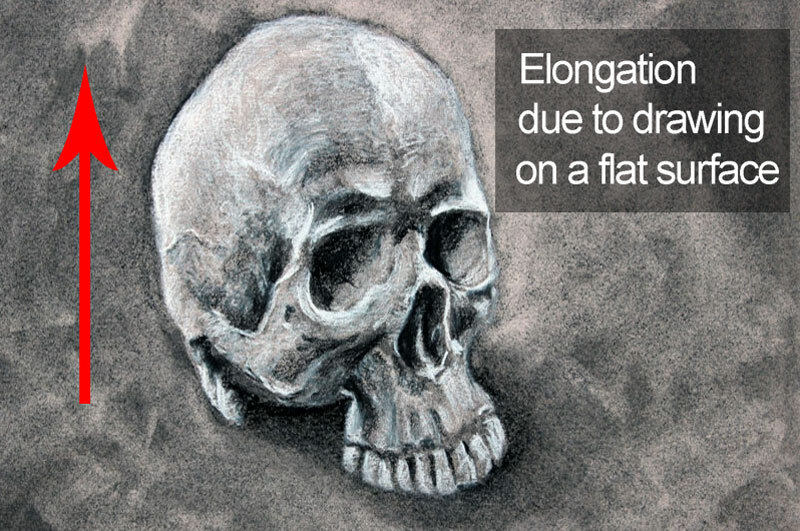 The most common form of distortion results in elongated drawings. The student may draw the subject from life, thinking that the work is accurate, only to lift it up and look at it directly, noticing the distortion. 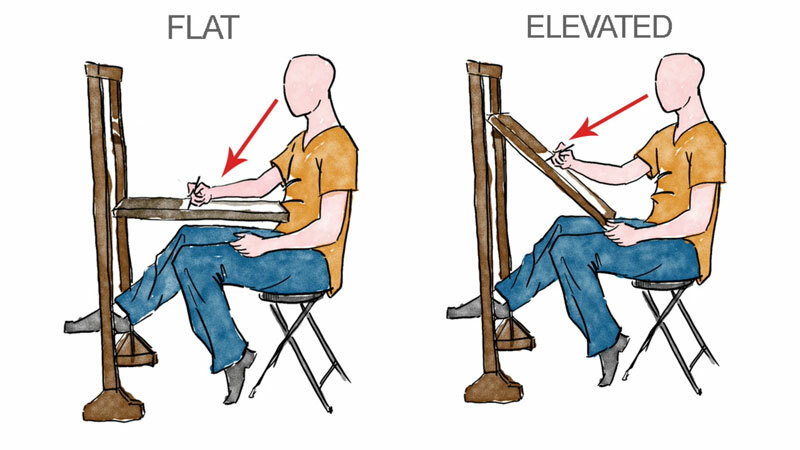 An easel or a drafting table provides the artist the ability to tilt the drawing to better match the angle in which the subject is observed. This eradicates much of the distortion that can occur from drawing on a perfectly flat surface. Although the angle may not match the observed view exactly, it is much closer to what is actually observed by the artist. This is why most experienced artists prefer to work on a tilted surface. It’s all about understanding how we view the subject and the angle in which we record the information on the drawing surface. It’s much easier to record what we see when the drawing surface matches (or closely matches) the angle in which we view the subject. Another advantage to working on a tilted surface is that it is much easier to step back from the work and make evaluations. Backing up and judging the progress of your work is important. This is often when we notice areas that should be addressed or mistakes that should be rectified. 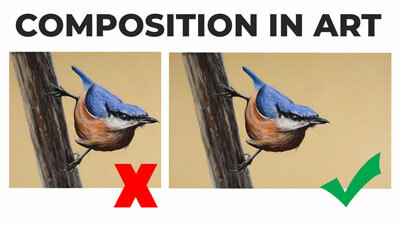 When drawing on a flat surface, you may stand to look down on the work, but if you want to evaluate it properly, then you must set it up against a wall and back away. When working on an easel or drafting table, we can leave the work in place and simply back up. It may not seem like a huge difference, but it does allow a bit more fluidity as we work, keeping our minds “in the groove”. 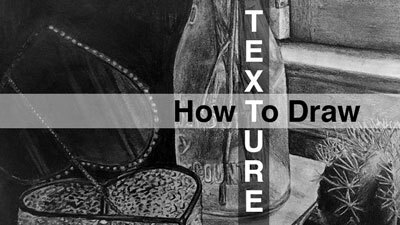 It may be difficult for beginning artists to make the shift to drawing on a tilted surface. 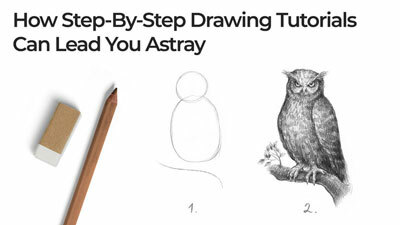 It is clearly different than how we write and how many of us first start drawing. It may be uncomfortable at first, but the benefits of drawing on a tilted surface often outweigh the initial awkwardness. What Drawing Angle is Best? You may be wondering then, what drawing angle is best? If we accept that drawing on a tilted surface, although possibly awkward at first, produces better accuracy in our drawings, then it’s safe to assume that there must be an optimal angle. Theoretically, the most optimal angle should match the angle at which you are viewing the subject. If you are drawing the subject from life, perhaps as still life arrangement, then you are most likely viewing the subject at 90 degrees. Therefore, the most optimal angle would be 90 degrees, with the drawing surface facing you directly. But before we start setting up our easel as flat as it can go, we have to consider the first point – “comfort”. It simply isn’t comfortable to draw at 90 degrees. It is difficult to tilt your hand in order to make controlled marks on the lower portion of the drawing surface at this extreme angle. So, although 90 degrees is theoretically the most optimal angle, practically it is not. Therefore, we need find a “happy medium” between flat and 90 degrees and this varies from artist to artist. Some will prefer more extreme angles while others are satisfied with a slight angle. In my case, my drafting table is set at 55 degrees, which is my “happy medium”. In the world of art, experimentation is always your “best friend”. Experiment with your setup and discover what works best for you. Although the angle in which you draw is important and does affect your success, the most important thing is that you are drawing. Don’t let the absence of an easel or a drafting table keep you from that. what i do is use a long ruler to go on the photograph and paper and make a line from head eyes and so on to match the hight and width of a drawing on flat surface so wont be elongated. For me who has a chronic back condition and cervical spondylosis in my neck, table top easel is best for me. When my back is very painful as it goes off a lot I cannot use the table easel so I have a couple of sketching boards I can use while on the sofa and I mange ok with these as I have them raised up on my knee. I have a Daler Rowney workstation for my table easel and you can turn it different ways that work for you, it’s a ball in socket kind of thing and it’s great. Flat is a big no no especially for my bad neck.